Most of January 19, 1941 was gray and overcast. The bleak weather had disappointed railfans intent on making photographs during the "last chance" fan trip of the three remaining surface streetcar lines in Rochester that day. Lines covered were Monroe-Clinton North (abandoned February 18, 1941), Portland-Dewey (abandoned March 11, 1941) and Lake-Main East (abandoned April 1, 1941). Finally, for a few minutes here and there, the sun crept out behind the clouds for a few sunny photos. So, with only three lines covered, one would think that it would be easy to deduce where our photo had been taken. It is easy to know this is the fan trip day because of the car used, 1907-built car 639 (the fans preferred the old deck-roof cars for their fan trips). 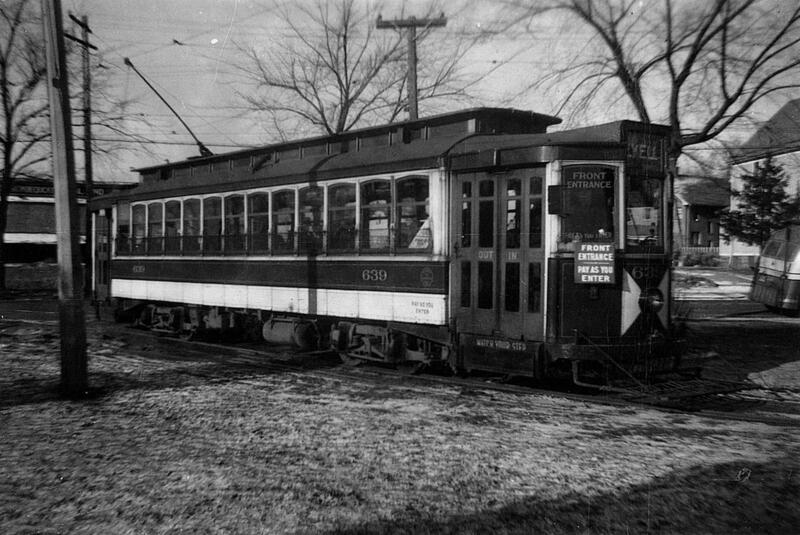 Also, in the words of Bill Gordon, "some joker" (see his Ninety Four Years of Rochester Railways, 1:51) has turned the roll sign to the 1939-abandoned LYELL signing, and the loop in the photo could not possibly have been the Glide Street loop since neither the geometry nor the sun angle is correct. Briefly, Dewey loop was considered; the RTC bus in the background suggested an active bus line. However, the key clue was the word "Irondequoit" barely visible in the building behind car 639 which, upon review of various plat maps, revealed itself as "Irondequoit Coal and Supply Co." This loop, therefore, is none other than the Clinton at Ridge Road loop. Travelers north of this point would have availed themselves of the waiting bus, for this was the northern-most loop on the Clinton North line. Soon, the fans this day will say goodbye to each other and to Rochester's surface street railways. New buses would arrive, the last line would be abandoned in less than three months, and Rochester would briefly become the largest city in the nation to have no surface streetcars.